Under the Endangered Species Act and the 1994 Record of Decision, it is up to the US Navy to answer questions and provide information confirming that their proposed actions described in their application for a Forest Service Special Use Permit would not adversely affect the viability of the spotted owl population on the western slopes of the Olympic Mountains. The Navy has thus far failed to provide the needed information. This concludes the Executive Summary to my Public Comments. The following page is a Table of Contents for the remaining 14 sections of this Public Comment. 1. What are maximum and average decibel readings of F18 Growler jets at flyover elevations of 900 feet, 1200 feet, 2000 feet and 6,000 feet above the ground? 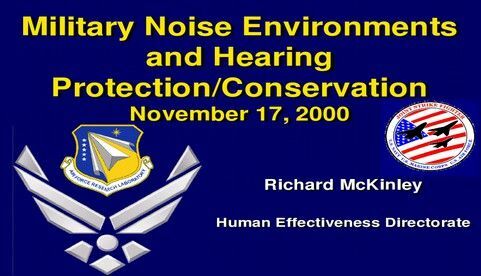 Given that decibels are on a logarithmic and not a linear scale, it is not acceptable or reasonable for the Navy to only provide decibel readings at a distance of 4 miles (21,000 feet) as they did in their 2010 report to the US Fish and Wildlife Service and then make inaccurate and unfounded claims about how such a reading at 21,000 feet might be translated to an estimated reading of 1200 feet. The Navy must conduct scientifically rigorous tests with independent monitors and then provide the public, the US Fish and Wildlife Service and the US Forest Service with accurate information before any determination is made regarding a Special Use Permit. 2. What are maximum and average decibel readings of older Prowler jets at elevations of 900 feet, 1200 feet, 2000 feet and 6,000 feet above the ground? The Navy has claimed that the new Growler jets are actually quieter than the older Prowler jets. This claim is directly contradicted by a 2008 Report from their own Navy Auditor as well as a 2012 independent study as well as thousands of reports and videos by private citizens all of which indicate that the Growler jets are about twice as noisy as the Prowler jets (or about 10 decibels louder than the older Prowler jets.). Given that one of the factors to be evaluated is historical use, it is essential that the public, the Fish and Wildlife Service and the Forest Service have a clear objective understanding of what the historical baseline noise levels might have been. The Navy still has lots of Prowler jets and they should be required to complete a Noise Study of these Prowler jets with independent monitors and then provide the public, the US Fish and Wildlife Service and the US Forest Service with accurate information before any determination is made regarding a Special Use Permit. 3. What is the current population of spotted owls on the Western slopes of the Olympic Mountains, what is their rate of decline and what is the extinction threshold for this population? The 1994 Record of Decision and the Endangered Species Act require the US Forest Service and the US Fish and Wildlife Service to affirmatively monitor the spotted owl population. The latest information by Forsman in 2012 indicates that there may be as few as 300 pairs of spotted owls remaining in the western slopes of the Olympic Mountains and that their rate of decline is about 4% per year (a loss of 12 pairs of spotted owls per year). My own analysis based on the work of biologist E. O. Wilson is that 300 pairs of spotted owls is already very near the extinction threshold and thus the loss of even a single pair of spotted owls may place the entire population of spotted owls in the Olympic Mountains at the brink of extinction. 4. What is the maximum noise volume that Northern Spotted Owls can endure before being disturbed? I have personally led more than 3,000 outings to Old Growth forests during the past 40 years. I have personally witnessed on many occasions northern spotted owls disturbed by normal human conversation of my students - which was only 60 decibels. I have also personally observed on many occasions that northern spotted owls are not disturbed by human whispers (which are only 30 decibels. I am therefore convinced that the threshold for disturbing Northern Spotted Owls is somewhere between 40 to 60 decibels. Based on over 40 years of personal experience with spotted owls in spotted owl habitat, I strongly disagrees with the US Navy claim that spotted owls would not be disturbed by a noise level of 90 decibels. Even humans suffer permanent hearing damage at chronic exposure to 90 decibels and our ears are no where near as sensitive to sound as spotted owl ears. Instead, I support the US Fish and Wildlife Field Survey Policy of avoiding any noise above 50 decibels (including human conversations of 60 decibels) when conducting surveys in spotted owl habitat. I instruct my students to whisper (which is only 30 decibels) when in spotted owl habitat. The US Fish and Wildlife Service also instructs their employees to whisper. My personal experience based upon more than 40 years of observing spotted owls is that an absolute upper limit of 60 decibels is the correct standard for spotted owl habitat. This low noise threshold is important not only for spotted owl nesting. It is also important for spotted owl hunting. The owls use their ears to hunt. If owls are inflicted with permanent hearing damage, which would be the case for anything over 80 decibels, they would not be able to hunt and the entire population would soon go extinct. The US Fish and Wildlife Service must conduct a Noise Assessment of Northern Spotted Owl behavior to objectively determine the maximum noise level they can tolerate. This study can be completed in 60 days and can be conducted at the same time that they are doing the survey of the spotted owl population. They will need accurate sound emission tools for the study to be scientifically valid and reliable. I propose that the US Navy be required to provide the US Fish and Wildlife Service with recordings of F18 Growler jets fly overs at 40 decibels, 50 decibels, 60 decibels, 70 decibels, 80 decibels and 90 decibels. 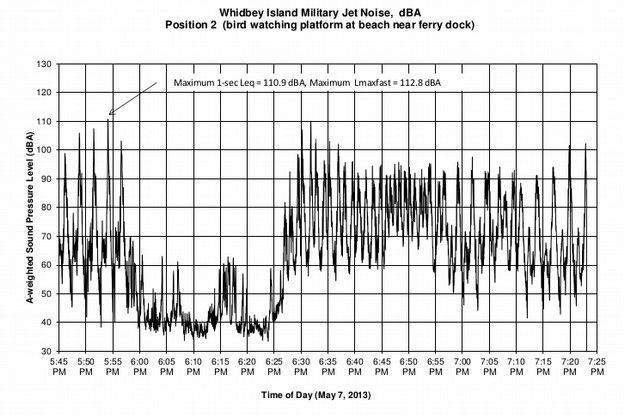 The Navy must disclose how far away (what elevation the jet was flying at) in feet when each recording was made in order to achieve these decibel readings. The Fish and Wildlife Service can then locate nesting owls and start the lowest recording of 40 decibels. Each recording should last for at least 10 seconds but no more than 20 seconds and should be stopped if the owls are disturbed. If the owls are not bothered by the 40 decibel tape, after a five minute pause, the 50 decibel tape should be started. Only if the owl is not disturbed, the test can continue all the way up to 90 decibels. The test should be conducted on at least 10 owls to have a valid sample size and a maximum of 20 owls to avoid harm to the species. If the Navy is correct, then no owls would be disturbed by this test. If I am correct, then at least half of the owls would be disturbed by the time the recording reaches 60 decibels and all of the owls would be disturbed by the time the recording reaches 80 decibels. The study should be completed by May 1 2015 so that the public would have an opportunity to read it before the Public Hearings start on May 15 2015. I realize that due to severe budget cuts, the US Fish and Wildlife Service and/or the US Forest Service may not have the funds or staff needed to conduct such a study of spotted owl populations and noise responses. 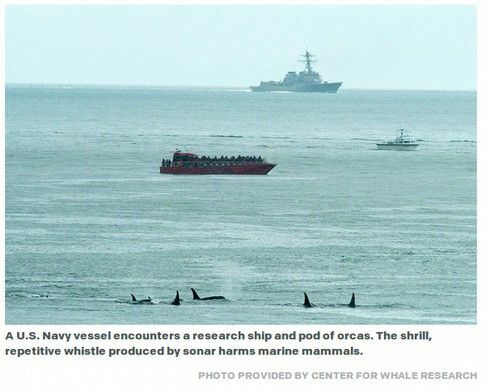 However, because the Navy is the one who has proposed this expansion of use and is asking for a Special Use Permit to allow them to use critical habitat in this manner, it is up to the US Navy to pay for such a study. In the absence of such a study, the studies by Forsman and others including my own studies must stand as the “best available scientific evidence” on spotted owl populations and behaviors and the application for a Special Use Permit must be denied. 1. Require the US Navy to conduct Noise studies of the F18 Growler jets and older Prowler jets and provide this information to the Forest Service and to the public no later than May 1 2015. 2. Require the US Navy to pay either the US Forest Service or US Fish and Wildlife Service to conduct a field survey of the spotted owl population on the western slopes of the Olympic Mountains and determine the rate of population decline and estimate the extinction threshold for this population. This study should also be completed no later than May 1 2015. 3. Extend the public comment period until July 1 2015. This will give the US Navy time to conduct the needed Noise studies of the F18 Growler jets and the older Prowler jets. It will also give the US Fish and Wildlife Service time to complete a survey of spotted owls on the western slopes of the Olympic Mountains and submit their report to the public by May 1 2015. 4. Conduct official and recorded public hearings in all affected communities as required by NEPA between May 15 2015 and June 15 2015 to allow the public a reasonable opportunity to ask questions of US Forest Service and US Navy officials and to make public comments on the proposed application. Reasonable opportunity means that each member of the public should be allowed at least 3 minutes to ask their questions and make their comments. This would also 20 people per hour to ask questions. Thus, to allow 200 people in each community to ask questions, the entire hearing should be scheduled for at least 10 hours and should be held in a room which would allow the attendance of at least 200 members of the public to sit. 5. Request that the Navy suspend all war game operations over the Olympic Peninsula until an accurate determination can be made regarding the effect that these current war games might have on the survivability of the spotted owl population in the Olympic Mountains. The evidence provided in this report, which includes the best available science on spotted owl populations indicates that even the current actions of the Navy are in violation of the Endangered Species Act and the 1994 Record of Decision. It is essential that these operations be halted immediately in order to protect the spotted owls on the Olympic Peninsula from going over the extinction threshold. The following public comments are a detailed explanation of why these actions are needed and are required by law. There are a couple of different ways to measure decibels. Both use decibel meters. The first way is to capture sound across all frequencies. Since humans cannot hear all frequencies, we are mainly interested in sound that humans can hear. Therefore nearly all commonly available decibel meters screen out very high and very low frequencies and measure only the middle sound frequencies. When the high and low frequencies are eliminated the remaining frequencies – audible to humans – is called the A scale. Technically, sound measured with such an A scale sound meter is indicated as dBA. For example 20 dBA is the sound level of a typical Old Growth forest. However, since nearly all sound meters are A scale meters, in this report when we use the term “decibel” we are referring to decibels measured on the A scale with an A scale sound meter. We will also use the abbreviated notation dB to mean dBA. 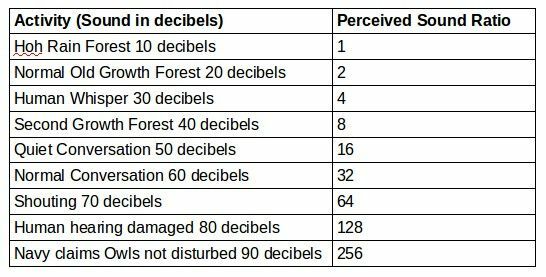 When we say that the sound level in an Old Growth forest is 20 dB – what we really mean is that it is 20 dBA and was measured by a common A Scale sound meter or other related human benchmark. The quietest recorded sound is about 10 decibels. It was recorded in the Hoh Rain Forest. Each 10 decibel increase means that humans and wildlife would perceived the sound to have doubled. This does not mean the sound's absolute pressure actually doubled. In fact, the absolute pressure may have increased by a factor of ten. But all sound is processed by the human brain or an animal brain and it is the brain's perception of sound that matters – not the actual pressure of the sound waves. Thus, a sound of 20 decibels is perceived to be about twice as loud as a sound of 10 decibels and a sound of 30 decibels is perceived to be twice as loud as a sound of 20 decibels. Because this way of measuring sound can be confusing to most people, I have created a series of visual tables and graphs. This first table and graph uses a scale of 1 for 10 decibels, 2 for 20 decibels, 4 for 30 decibels, 8 for 40 decibels, 16 for 50 decibels, 32 for 60 decibels, 64 for 70 decibels and 128 for 80 decibels. Since 10 decibels is the sound of the Hoh Rain Forest, this graph can be thought of as how much louder various activities are compared to the extreme quiet of the Hoh Rain Forest. Here is a graph of the above table. The above graph makes it easier to compare the extremely quiet world of the Hoh Rain Forest and normal Old Growth Forests that spotted owls have adapted to over millions of years to the Navy's claim that spotted owls are not disturbed by chronic exposure to the toxic noise level of 90 decibels – which is 256 times louder than the Hoh Rain forest! As loud as 90 decibels is, it is nothing compared to the noise level of 150 decibels created by an F18 Growler military jet. To even begin to understand how loud 150 decibels is, I have made the following table and graph with a normal human conversation of 60 decibels set for 1, human shouting of 70 decibels set for 2, human hearing damage level of 80 decibels set for 4, the Navy claim of Growler jet noise level of 90 decibels set for 8, a power mower set for 100 decibels, a loud motorcycle set for 110 decibels, normal jet noise set for 140 decibels and the Growler's actual maximum noise level set for 150 decibels. Here is the graph of the above table. A Growler Jet Engine is 500 times louder than a normal human conversation – and a normal human conversation is known to disturb spotted owls. Since a normal human conversation is 32 times louder than the normal background noise in the Hoh Rain Forest, this means that a growler jet flying over the Hoh Rain forest and within 1000 feet of spotted owls is 16,000 times louder than spotted owls have evolved to hear. The Navy proposes having four to eight of these Growler jets flying over spotted owls about once or more per hour about 11 times per day with at least 100 fly overs per day for 260 days per year – over 26,000 fly overs per year for the next 10 to 20 years. These extremely loud military jets would approach the defenseless owls without any warning beginning before dawn and at a speed of 700 to 1200 miles per hour. 720 miles per hour is 12 miles every minute or 1 mile every five seconds. The owl hearing is so sensitive, that they would likely first hear the Growler military jets while they are 12 miles away at a decibel reading of 10 decibels. Within 5 seconds, the jet would only be 11 miles away and the sound would double to 20 decibels. 5 more seconds, the jet would only be 10 miles away and the sound would double again to 30 decibels. Below is a graph of the above table. Human hearing begins to be permanently damaged at 80 decibels. Therefore since spotted owl hearing is 10 to 100 times more sensitive that human hearing, it is likely that spotted owl hearing is permanently damaged at 70 decibels or less. This damage would begin to occur 30 seconds after the owl first hears the jet approaching and 30 seconds before the jet is directly overhead. This damage would continue for 30 more seconds as the jet was leaving. Therefore with every jet flyover the owls would be exposed to toxic noise for at least one minute – sixty times more than the one second claimed by the Navy. 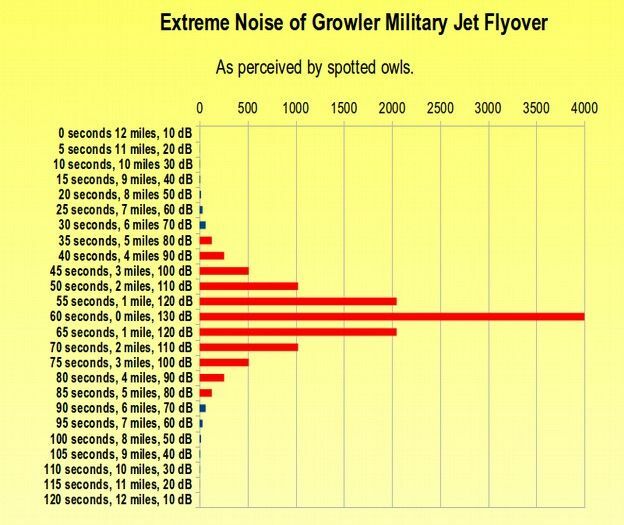 It is likely that even one single fly over by a Growler jet could cause permanent hearing damage in the spotted owls. If there are 120 flyovers per day, each owl would be subjected to 120 minutes per day of chronic toxic noise. Over five days per week, this would equate to 600 minutes or ten hours of toxic noise per week. Over 52 weeks in one year, this would equate to 520 hours of toxic noise per year. By this point, the entire owl population would be deaf – and go extinct shortly after that as they would no loner be able to hear well enough to hunt their prey. The following is a brief chronology of efforts during the past 45 years to protect biodiversity. This history is important because it reveals that the transgressions of the US Forest Service, the US Fish and Wildlife Service and the US Navy today in terms of ignoring scientific research in order to maximize short term profits by sacrificing the long term health of the environment are very similar to the transgressions of the US Forest Service, US Fish and Wildlife Service and the Logging Industry in the 1980s. There is a disturbing pattern of government agencies ignoring federal laws such as the National Environmental Policy Act and the Endangered Species Act and thus requiring the public to go to court in order to enforce these federal laws. In the 1970s and 1980s, Forest Service and Fish and Wildlife Service rubber stamping of logging permits led to the destruction of over 90% of our Old Growth forests. Now, the Forest Service and the Fish and Wildlife Service rubber stamping of reckless Navy plans risk destroying the last remaining ten percent of our Old Growth forests and the owls that live in them. Below is a brief history of how all of this happened. In 1969, Congress passed the National Environmental Policy Act (NEPA). (42 US Code 4331). Through this Act, the federal government recognized "each generation's responsibility to act as a trustee of the environment for future generations." The Act mandates a coordination of all Federal plans, agencies, policies, actions, puts the protection of our environment as a Federal policy, to "assure for all Americans safe, healthful, productive and esthetically and culturally pleasing surroundings...without degradation, risk to health or safety, or other undesirable or unintended consequences." NEPA requires public notice in affected communities (which was not done in this case) and public hearings in affected communities (which also has not been done). NEPA also requires the use of the most recent and best available science (which was not done in the Navy Environmental Assessment). NEPA also requires that the US Forest Service and the US Fish and Wildlife Service to conduct an independent and accurate assessment of the claims made by the Navy (which thus far has also not been done). NEPA also requires the US Forest Service to consider cumulative impacts of the proposed project and how it relates to other past, present and future projects and potential uses of our national forests. Cumulative impacts include the effects of future State, local, or private actions that are reasonably certain to occur in the area considered in the proposed project. Potential impacts of the entire project must be fully analyzed and disclosed. Thus far, the Forest Service has mistakenly limited its inquiry to merely the mobile electronic transmitters on Forest Service roads and refused to consider the actual interaction between the mobile transmitters and the planes flying overhead and how the noise of the entire proposed operation might affect endangered species such as spotted owls and marbled murrelets. Why did the Forest Service fail to give adequate notice in the most affected communities of Port Angeles, Port Townsend and Forks? Why has the Forest Service refused to provide recorded public hearings to allow the public an opportunity to ask questions of Navy and Forest Service officials? When will the Forest Service hold recorded public hearing? Why has the Forest Service not conducted their own independent research? Why has the Forest Service refused to consider the cumulative impacts of the proposed project including noise from Growler jets flying over critical habitat for spotted owls? In 1973, Congress passed the Endangered Species Act (ESA). (16 U.S.C. § 1531 et seq.) The Endangered Species Act established protection over and conservation of threatened and endangered species and the ecosystems upon which they depend. The intention of the ESA is to protect not only endangered species but also protect the genetic diversity of all life on earth – recognizing that human life is also dependent on maintaining the genetic diversity of our ecosystem. Endangered species are considered the “canaries in the coal mine” in that they are “indicator species” of the health of the particular ecosystems – such as Old Growth Forests – as well as the health of the entire environment. The primary purpose of the ESA is to provide “...a means whereby the ecosystems upon which endangered species and threatened species depend may be conserved ...“ (ESA, Sec. 2(b)). The ESA mandated that formal “consultation” occurs between Federal agencies and the US Fish and Wildlife Service before any actions could begin that might potentially harm the species or its habitat (ESA, Section 7). In the 1970s, high speed logging machines were introduced which greatly accelerated the destruction of old growth forests. In 1973, the spotted owl was listed on a preliminary list of threatened species by the US Fish and Wildlife Service due to the rapid destruction of their habitat. In 1974, I (David Spring) graduated with a degree in Science Education from Washington State University and began teaching Environmental and Outdoor Education Courses at various colleges in Washington State. During my three thousand wilderness outings between 1974 and 2004, I had a front row seat in watching the destruction of the Old Growth forests in Washington State. In 1976, Howard Postovit conducted the first survey of spotted owls in Washington State including a survey of spotted owls in the Olympic Mountains. 14 owls were located at 13 sites in the Olympic Mountains. All were found in Old Growth forests. (See Gutierrez 1985). In 1977, Eric Forsman and others surveyed areas in the Cascade and Coast Ranges, including extensive areas of second-growth forests 40-90 years old. Spotted Owls were 12 times more abundant in old growth forests than in forests that were less than 80 years old. Later several more researchers confirmed the owl preference for old growth forests and also noted that the owls greatly preferred habitat near streams (which is true of nearly all wildlife). (See Forsman. Eric D.; Meslow. E. Charles; Strub, Manic J. Spotted owl abundance in young versus old-growth forests, Oregon. The Wildlife Society Bulletin 5(2): 43-47; 1977). Based on the above study, also in 1977, the Oregon Interagency Task Force developed the first habitat management plan for the spotted owls on public lands in Oregon. 300 acres were recommended per owl pair. (See Gutierrez 1985). In 1978, Ken Dzinbal conducted the second owl survey in Olympic National Park. Covering much more ground than the previous survey, he found 54 owls at 38 locations in 276 hours. (See Gutierrez 1985). In 1980, the Oregon Washington Interagency Committee raised the recommendation for owl pair habitat be raised from 300 acres to 1000 acres per owl pair. This was based on a 1980 study by Forsman who tracked 6 owls pairs and found that they used a minimum of 1,008 acres to forage for food during a single year. The recommendation ignored the fact that five of the six owl pairs required more than 2000 acres of old growth forest. The average range size was nearly 3000 acres. This data and other similar studies were later submitted to the federal court as evidence that the Forest Service was not making a good faith effort to protect spotted owls. In 1981, Olympic National Forest was directed to manage Northern Spotted Owl habitat using Spotted Owl Management Areas (SOMAS). The third survey was conducted by Maureen Beckstead. She found 41 owls in 332 hours. This was substantially fewer owls than had been found three years earlier. Many previously occupied sites were empty. In 1982, the fourth survey was conducted by Maureen Beckstead. She found 40 owls in 442 hours of calling. In 1983, the fifth survey was conducted by Maureen Beckstead with the help of volunteers. The team spent 1577 hours calling and got 77 total responses and sightings. All of the above surveys were done on US Forest Service land on the Olympic Peninsula. In 1984, an estimate of the spotted owl population in Olympic National Park were made at 42 to 109 pairs. In 1983, Parry et al published a controversial study concluding that the recent acceleration of logging of Northwest Old Growth forests (due to the new logging machines) was not sustainable over time. (See Parry B. T. Vuax H.J. and Dennis, N. 1983 Changing Concepts of Sustained Yield Policy on the National Forests Journal of Forestry 81:150 to 154). In 1984, I (David Spring) began teaching Environmental Education and Outdoor Education course at Bellevue College in Bellevue Washington. Also in 1984, Eric Forsman published the first detailed study of the decline of the spotted owl population in NW Old Growth forests. In 1986, a version of this study was published by the National Audubon Society. This report was a key motivator for the Audubon Society to eventually file a lawsuit against the Forest Service. (See Forsman, Eric C. Meslow, and H.M. Wight. 1984. Distribution and biology of the spotted owl in Oregon. Wildlife Monographs 87:1-64 and Forsman, Eric and E C Meslow 1986 The spotted owl Page 742 to 761 in Audubon Wildlife Report National Audubon Society). “The present (1985) populations of spotted owls are about 1,200 pairs in Oregon (Carleson and Haight 1985), 1,000 pairs in Washington (U. S. Department of the Interior 1982), and 1,260 pairs in California (Gould 1985). These populations will probably decrease with continued harvesting of mature and old-growth timber (Forsman and others 1982).” Of the 1000 owl pairs in Washington in 1985, about one third were believed to be on the Olympic Peninsula. (See Gutiérrez, R. J., and Carey, A. B., tech. eds. 1985. Ecology and management of the spotted owl in the Pacific Northwest. General Technical Report, PNW-185. U.S. Department of Agriculture, Forest Service, Pacific Northwest Research Station, Portland, OR. 119 pp. What really caused the loss of jobs in the logging industry? Throughout the spotted owl litigation from 1987 to the present day, the owners of logging companies blamed the spotted owls for the loss of logging jobs. 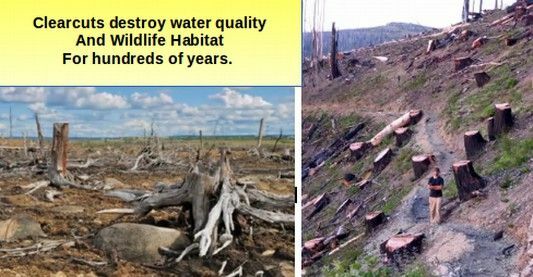 But the truth was that 90% of all logging job losses occurred 20 years before the first actions were taken to protect the last remaining stands of Old Growth forests. 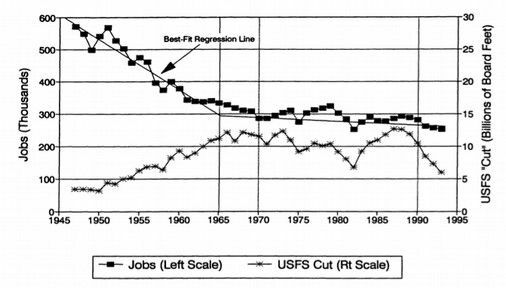 As the following chart shows, what caused the decline in logging jobs was not spotted owls, but greedy corporations who replaced their workers with machines to increase corporate profits. Seattle Audubon Society; Pilchuck Audubon Society; Washington Environmental Council; Washington Native Plants Society; Oregon Natural Resources Council; Portland Audubon Society; Lane County Audubon Society; Siuslaw Task Force, Plaintiffs versus. F. Dale Robertson, in His Official Capacity as Chief, United States Forest Service; United States Forest Service, an Agency of the United States, Defendants- 914 F.2d 1311 (9th Cir. 1990). The litigation was rapid and complex. But it is worth recounting here because it illustrates that justice can eventually prevail. In October 1987, the Portland Audubon Society and other environmental organizations filed an action in federal district court for declaratory and injunctive relief, challenging forest management activities of the Bureau of Land Management, U.S. Department of the Interior, as violating the National Environmental Protection Act ("NEPA"), 42 U.S.C. Secs. 4321-4347, and the Federal Land Policy and Management Act, 43 U.S.C. Secs. 1701-1782. The Portland district court dismissed the action and the Portland Audubon Society appealed the decision. In 1989, the federal court of appeals reversed the decision. (See Portland Audubon Society v. Hodel, 866 F.2d 302 (9th Cir. ), cert. denied, --- U.S. ----, 109 S.Ct. 3229, 106 L.Ed.2d 577 (1989)). On remand, the district court again dismissed the action. The Portland Audubon Society again appealed the decision. The federal court of appeals again reversed the district court. On October 23, 1989, the Portland Audubon renewed its motion in the district court for summary judgment under the Federal Land Policy and Management Act. The case was eventually consolidated with the Seattle Audubon Society case on appeal. In 1988, the US Forest Service created a new forest plan which it claimed would protect spotted owls from extinction. But the new plan was a farce as it ignored the best available science and continued massive logging of old growth forests. On February 8 1989, the Seattle Audubon Society and other environmental organizations filed a complaint for declaratory and injunctive relief in federal district court in Seattle against certain US Forest Service administrative decisions arguing that the Forest Service 1988 plan did not provide adequate protection for Spotted Owls and their habitat. They moved for a preliminary injunction based upon the urgency of the matter. Federal district court judge William Dywer first rejected the preliminary injunction but later granted a renewed motion for preliminary injunction halting certain planned timber sales. (See 1989 William Dwyer Seattle Audubon Society et al, versus Robertson US District Court, Seattle Washington Civil Case C89-160). On November 6, 1989, based on section 318, the district court in Seattle Audubon vacated the preliminary injunction. The district court rejected Seattle Audubon's argument that section 318 violates the separation of powers doctrine and is therefore unconstitutional. The district court retained jurisdiction over the case and certified for appeal under 28 U.S.C. Sec. 1292(b) its decision to vacate the preliminary injunction. On December 21, 1989, the district court in Portland Audubon granted the government's motion to dismiss, based on section 318, over Portland Audubon's constitutional challenge to section 318. Both cases then went to the court of appeals. On June 22 1990, the US Fish and Wildlife Service declared spotted owls as a threatened species. After this action, the Forest Service strangely claimed that they no longer had a duty to protect the owls because the duty had been transferred to the Fish and Wildlife Service. The federal court rejected this strange argument. But it shows how far the Forest Service was willing to go in order to continue its illegal logging practices. It was even willing to violate its own written regulations. The Forest Service's regulations, specifically 36 C.F.R. § 219.19, expressly require the planning process under the NFMA to identify habitat "critical for threatened and endangered species" and to determine objectives for such species "that shall provide for, where possible, their removal from listing as threatened and endangered species through appropriate conservation measures." Moreover, Section 219.27 provides that the "minimum specific management requirements" shall include measures for preventing the destruction or adverse modifications of critical habitat for threatened and endangered species. See 16 U.S.C. §§ 1600-1687 (1985) ("NFMA"); 36 C.F.R. § 219.19. In October 1990, the Seattle Audubon Society filed an amended complaint challenging the new position of the Forest Service and insisting that the Forest Service had to comply with the Endangered Species Act as well as its own regulations. The Seattle Audubon Society asked for an injunction against all timber sales in spotted owl habitat pending preparation of such regional guidelines, as well as an accompanying environmental impact statement. On March 7, 1991, US District Judge William Dwyer ruled in favor of the Seattle Audubon Society on cross-motions for summary judgment, holding that the Forest Service must comply with both the NFMA and the ESA before taking any action that will affect the owls. Testifying at a hearing in this case, biologist Eric Forsman stated, "There was a considerable amount of political pressure to create a plan which had a very low probability of success and which had a minimum impact on timber harvest." Q. Can you summarize why you recommend that there be no further logging while the agency determines its new management plan? A. I recommend a cessation of logging of owl habitat in the short run because I think the risk that the population crosses a very significant viability threshold is increased significantly by continued loss of its habitat. This will reduce the options to maintain viability in the future. (There is a)... very significant risks to the spotted owl population; that is, a reasonably high probability that it would cross such a threshold line. The court must weigh and consider the public interest in deciding whether to issue an injunction in an environmental case... It must also consider the balance of equities among the parties... The problem here has not been any shortcoming in the laws, but simply a refusal of administrative agencies to comply with them. This invokes a public interest of the highest order: the interest in having government officials act in accordance with law. See Olmstead v. United States, 277 U.S. 438, 485, 48 S.Ct. 564, 575, 72 L.Ed. 944 (1928) (Brandeis, J., dissenting). Judge Dwyer ordered the Forest Service to prepare a new Environmental Impact Statement (EIS) that complied with the guidelines of the National Environmental Policy Act (NEPA) and to legally adopt a conservation management plan that complied with the guidelines of the Endangered Species Act by providing adequate protection for the Northern Spotted Owls by March 5 1992. The Forest Service immediately appealed Judge Dwyer's decision continuing to argue that it no longer had any duty to maintain a viable population of spotted owls once they were listed under the Endangered Species Act. This landmark appeal was argued by Michael Axline of the Western Environmental Law Clinic with the University of Oregon in Eugene, Oregon and Victor Sher, of the Sierra Club Legal Defense Fund in Seattle, Washington on behalf of the Seattle Audubon Society, the Portland Audubon Society and many others. In its appeal, the Forest Service claimed that it was no longer required under the NFMA to plan for the future survival of the spotted owl because the Fish and Wildlife Service had declared the owl threatened under the Endangered Species Act, 16 U.S.C. §§ 1531-1543 (1985) ("ESA"). The Forest Service contended that it was only required to plan for "viable" species, and that once a species was declared threatened or endangered under the ESA, the species was no longer viable. Under the Endangered Species Act enacted in 1973, the word "take" is defined in a broader way to include "harass," and "harm," 16 U.S.C. § 1532(19). The broadest term, "harm," is defined by ESA to include habitat modification or degradation. "Harm" under the Endangered Species Act definition of "take" means: [A]n act which actually kills or injures wildlife. Such act may include significant habitat modification or degradation where it actually kills or injures wildlife by significantly impairing essential behavioral patterns, including breeding, feeding, or sheltering. The Appeal Court's affirmation of the district court's opinion basically created a stalemate that led to a dramatic reduction in logging in the Pacific Northwest – but no acceptable plan for protecting spotted owls. In October, 1992, presidential candidate Bill Clinton promised that, if elected, he would convene a “forest summit” to address the issue. The Presidential election and subsequent changes in the Administration quickly led to new interest in resolving the timber and forest management conflict in the Northwest. In November 1992, Bill Clinton was elected President in part on a pledge that he would solve the spotted owl controversy. In April 1993, shortly after taking office, President Clinton ordered all sides in the spotted owl controversy to meet in Portland Oregon and stay there until an agreement had been worked out. Together, these groups which included environmentalists, logging corporations and the US Forest Service negotiated a compromise called the Northwest Forest Plan that was supposed to provide protected habitat for spotted owls by eliminating logging on most Old Growth Forests. The plan used a concept developed by Edward O. Wilson called Clusters and Corridors where by spotted owls would have home communities and could migrate between home communities to avoid genetic isolation and preserve genetic diversity. The single most important cluster was the spotted owl population on the western slopes of the Olympic Mountains in and near Olympic National Park. The team assembled to hammer out the details of this plan was called the Forest Ecosystem Management Assessment Team (FEMAT) and consisted of Federal, State, private, and university specialists in many fields including ecology, biology, economics, sociology, forestry, ecology, and many other areas. Over 600 persons were ultimately involved. On 13 April 1994, the Secretaries of the Interior and Agriculture adopted the FEMAT plan as the 1994 Record of Decision (1994 ROD See USDA and USDI 1994). On December 21 1994, Judge Dwyer formally approved what was now called the 1994 Northwest Forest Plan. Judge Dwyer reinforced the importance of monitoring in his decision declaring the Plan legally acceptable: “Monitoring is central to the [Northwest Forest Plan’s] validity. If it is not funded, or done for any reason, the plan will have to be reconsidered.” (See Dwyer, W.L. 1994. Seattle Audubon Society, et al. v. James Lyons, Assistant Secretary of Agriculture, et al. Order on motions for Summary Judgment RE 1994 Forest Plan. Seattle, WA: U.S. District Court, Western District of Washington). 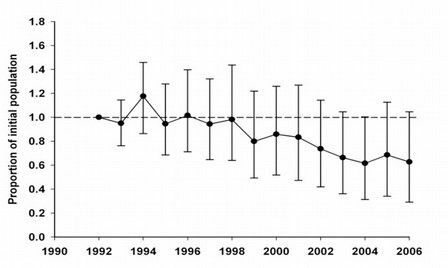 In 1996, a comprehensive analysis of the rate of change of the spotted owl population was published. Called a “meta-analysis,” the study was conducted by Burnham and others that merged the demographic studies of individual northern spotted owl populations. This was done to determine the overall trend of the spotted owls throughout all geographic study areas combined. Results indicated that the overall spotted owl population was declining at a rate of 4.4 percent. One of the requirements of the 1994 Record of Decision was that a series of “clusters” be established in Washington State to act as home bases for spotted owls. These are primarily located at relatively low elevation forests in National Parks and wilderness areas. However, it was known that the distance between the cluster at Mount Rainier National Park and the cluster in the Glacier Peak Wilderness area were too far apart – and the Alpine Lakes Wilderness area near Snoqualmie Pass was too high in elevation to provide suitable habitat for spotted owls. It was therefore wisely decided by all parties to turn the Upper Middle Fork Valley east of North Bend Washington into a semi-wilderness area. This would require cooperation from the US Forest Service and the Washington State DNR which managed the Mount Si Conservation area - thousands of acres of wildlife habitat near North Bend. A King County Commission, called the Middle Fork Planning Commission was formed to plan the future of this new wilderness area. Coincidentally, my home (which has an Old Growth forest on a portion of it) was located in the middle of this conservation area. I was therefore appointed to this King County Commission and helped write the plan to preserve the Old Growth forests in the Upper Snoqualmie River Valley. During this time, I became more aware of the DNR plans to save (or destroy) the spotted owl population in Washington State. My home is not far from where this picture was taken. I will briefly summarize the results here. At the time, there were only two official studies on spotted owl population rates of decline in Washington State. One somewhat biased study concluded the rate of decline was only one percent per year. The other better done study concluded the rate of decline was 12% per year. The State DNR plan used the more optimistic rate of 1 percent decline and ignored the other study completely. I argued that this violated the Endangered Species Act which called for using the “best available science.” I argued that, in the absence of other information, the weighted average of the two studies should be used. This would mean an assumed rate of decline of 5% per year. Shortly after I submitted this report, a detailed analysis by Burnham (1996) concluded that the rate of decline was 4.5 percent per year. Next I estimated the spotted owl population in Washington State based on the two most reliable sources available at that time. Here is a quote from my report to the US Fish and Wildlife Service: “The actual Spotted Owl population currently existing in Washington state is unknown. The U.S.F.W.S. stated (in their Draft E.A.A. for the 4(d) Rule, Page 69, 1995) that there are 762 known activity centers (pairs and singles) in Washington state. A survey of Washington state Wildlife biologists indicated an estimate of about 900 (or less) total owl pairs (including known and unknown owls) at the present time (1995). I therefore used an estimate of 900 spotted owl pairs in 1995 in Washington State. I next used the theories of biologist E. O. Wilson to estimate the “extinction threshold” below which it would be very difficult to restore spotted owls to a viable population. The details of this analysis are provided in my report. My conclusion was that the extinction threshold is about 300 pairs of Spotted Owls for the entire State. I then provided a table of the decline in spotted owl populations based upon six different sets of assumptions. Below is a graph showing the rate of decline for what I described as the most likely scenario which was a rate of decline of 5% per year. 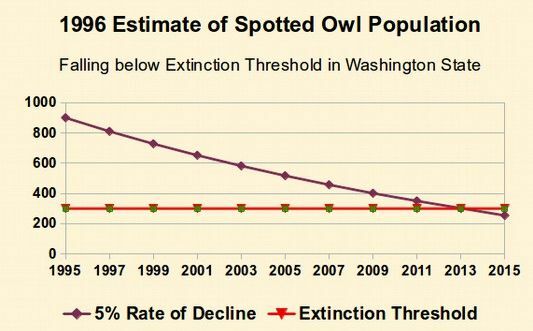 As you can see from the above graph, I predicted in 1996 that if the rate of decline was 5%, then the spotted owls in Washington State would pass the Extinction Threshold of 300 pairs in about 2014. Sadly, the US Fish and Wildlife Service ignored my study. However, it was widely shared in the environmental community. In 2003, the Northwest Ecosystem Alliance was conducting a review of the Washington State DNR Habitat Conservation Plan. They contacted me and asked me to update my study. By this point, there had been an additional study on the rate of decline of spotted owl populations in Washington State. 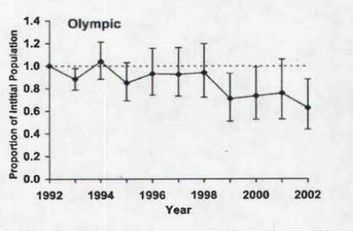 This study, done by Eric Forsman, found that the rate of decline was about 6% - with the rate of decline in the Olympic Mountains being about 4%. Essentially, my conclusion was that spotted owls in most parts of Washington State would pass the Extinction Threshold shortly bat about 2014 and that spotted owls in the Olympic Mountains would pass the extinction threshold in about 2015 to 2016. In September 2005, Lint published a review of the research on spotted owl populations during the preceding 10 years. (See Lint, J., 2005. 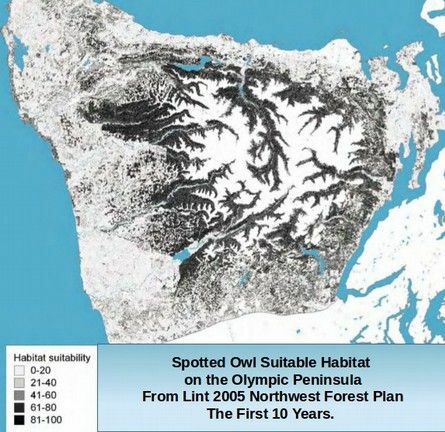 Northwest Forest Plan--the first 10 years (1994-2003): status and trends of northern spotted owl population and habitat. Gen. Tech. Rep. PNW-GTR-648. Portland, OR: U.S. Department of Agriculture, Forest Service, Pacific Northwest Research Station. 176 p.
Below is a map that was produced by Lint of the best habitat for spotted owls on the Olympic Peninsula. You can see that the best habitat for spotted owls remaining in the Olympic Peninsula is right in the middle of the western slopes of the Olympic Mountains. This is exactly where the Navy now wants to conduct their electronic warfare games. See Anthony RG, Forsman ED, Franklin AB, Anderson DR, Burnham KP, White GC, Schwarz CJ, Nichols JD, Hines JE, Olson GS, Ackers SH, Andrews LS, Biswell BL, Carlson PC, Diller LV, Dugger KM, Fehring KE, Fleming TL, Gerhardt RP, Gremel SA, Gutierrez RJ, Happe PJ, Herter DR, Higley JM, Horn RB, Irwin LL, Loschl PJ, Reid JA, Sovern SG (2006) Status and trends in demography of northern spotted owls, 1985-2003. Wildl Monogr 163: 1-47. Elsewhere in his book, Forsman essentially agreed with my 1996 analysis that there were about 900 spotted owl pairs in Washington State in 1994. The reason the above chart is stable to 1998 is simply because there were no studies during that period. The reason for the huge brackets around the dots is because with so few studies, there is a high degree of statistical uncertainty as to what the spotted owl population really is in Washington State. However, his research concluded that the population of spotted owls declined in half between 1994 to 2006 – which is almost precisely what I predicted would happen in my 1996 study. Between 2005 ro 2007, despite all of the above research confirming the decline in spotted owl population, the Bush administration attempted to increase logging on Old Growth Forests. There have been numerous lawsuits on all sides in the past few years as private corporations seek to get the last drop of profit out of the timber in these Old Growth forests. Even after Obama was elected in 2008, the lawsuits and the logging have continued. The conclusion of all of the above research is that the spotted owl population is currently on the brink of passing the Extinction Threshold in Washington State. In the Olympic Mountains, unless there are radical changes in the actions of the Washington State DNR and the US Forest Service, spotted owls will pass the Extinction Threshold in the Olympic Mountains sometime between 2015 to 2017. We will next estimate the current population of spotted owls currently hanging on to existence on the Western slopes of the Olympic Mountains as this is extremely relevant to the need to protect owls and their habitat from any further degradation. We have previously shown that in 1994, in agreement with Forsman, there were about 900 pairs of spotted owls in Washington State in the early 1990s. Since about one third of the remaining Old Growth Forest in Washington State is on the western slopes of the Olympic Mountains, we can assume that about one third of these 900 pairs of spotted owls – or 300 pairs of spotted owls – lived on the west slopes of the Olympic Mountains in 1994. Forsman and others have concluded that the rate of decline of the spotted owl population in the Olympic Mountains is 4% - or less than in the rest of the State of Washington where the rate of decline was from 5% to 7%. In the previous section, I used theories from E. O. Wilson to estimate that the Extinction Threshold in Washington State was 300 pairs of spotted owls. This means thatthe Extinction Threshold in the western slopes of the Olympic Mountains would be 100 pairs of spotted owls. 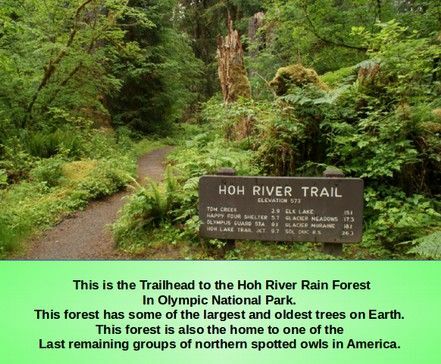 This would mean 20 or fewer pairs of spotted owls at each of the western Olympic Mountains five great rivers: the Sol Duc, the Bogachiel, the Hoh, the Queets and the Quinault. owls are being targeted for as part of the Navy's proposed war zone. In 1994, there were about 300 pairs of spotted owls in these five major river basins. This would mean about 60 pairs of spotted owls in each of the five major basins. At a 4% rate of decline determined by Forsman and others, this would mean a loss of 12 owl pairs out of the original 300 owl pairs per year or 24 owl pairs every 2 years. Below is a graph of how long it would take the spotted owls at this rate to reach the extinction threshold of 100 owl pairs. Thus, even without the Navy War Zone, the spotted owls in the western Olympic Mountains are hanging on by a thread. Without major changes by the US Forest Service and/or the Washington State Department of Natural Resources, the spotted owls in the western Olympic Mountains will pass the extinction threshold somewhere around the year 2020. Even today, in 2014, there are only about 116 spotted owls left in the western Olympic Mountains. It will only take the loss of 16 more owls to push the owls over the extinction threshold cliff. Earlier in this public comment, we reviewed the concept of decibels and showed that spotted owls evolved to live in a world that is much quieter than the human world. Here we will take a more detailed look at the extremely quiet world of spotted owls. Owls have evolved many important adaptations which help them hunt in the extremely quiet world of an Old Growth Forest. These include large heads, accommodating large eyes and ears, extremely mobile heads, capable of rotating 270 degrees to point their ears in the sound of their prey, asymmetrical ears, able to calculate flight angles of prey and feathers that absorb all sound, creating silent flight. All of these adaptations are intended for success in a quiet environment! Humans live in an extremely noisy world compared to the extremely quiet world of spotted owls. Our ears have gotten used to this noise and even manage to screen much of it out. In addition, if the noise level in our world gets too loud, we can cover our ears with our hands or put on commercial grade ear mufflers. The spotted owls do not have hands and do not have access to ear mufflers. The average sound level in an Old Growth forest is 20 decibels. To a spotted owl, even a human whisper, which is 30 decibels, would sound loud. The Hoh Rain Forest has been measured as 10 decibels – one of the quietest places on earth. Below is a graph comparing the sound in the Hoh Rain Forest to a normal human conversation. In the extremely quiet world of spotted owls, even a human whisper is loud. With their ears adjusted for such a quiet world, a normal human conversation sounds to spotted owls much like a jet aircraft sounds to us. This is why the US Fish and Wildlife Service advises field monitors to be extremely quiet while doing field surveys of spotted owls. 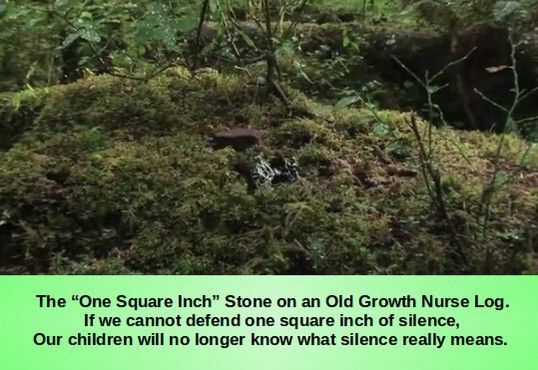 The “One Square Inch” marker, located 3 miles east of the Hoh Rain Forest Visitors Center, and in the middle of one of the most ancient forests in the world is considered the quietest place in the United States by sound researcher Gordon Hempton - with a decibel rating of 10 decibels. A normal Old Growth forest is 20 decibels and a human whisper is 30 decibels. 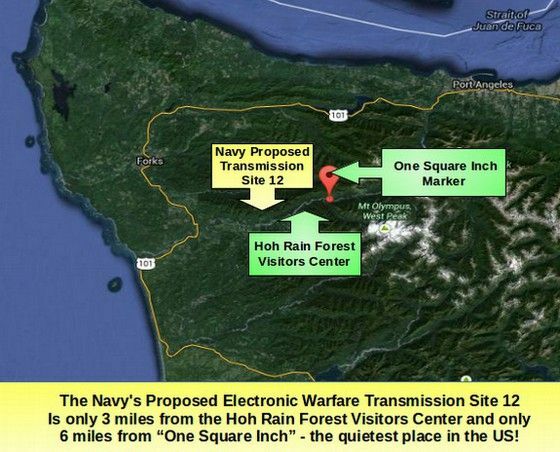 The Navy proposes to locate Electronic Warfare Transmission Site 12 only 3 miles west of the Hoh Rain Forest Visitors Center and then attack Site 12 thousands of times with hundreds of Growler Military Jets which have a decibel rating as high as 150 decibels. This protocol should also be applied to activities that disrupt essential breeding activities and to activities that may injure or otherwise harm spotted owl other than through habitat modification (e.g., noise disturbance, smoke from prescribed fire)... Do not broadcast loudly and do not use agitated or barking calls near a potentially active nest – this could agitate the female more than necessary or draw females off the nest. Wildlife Service (USFWS) issued guidance for estimating the effects of auditory and visual disturbance to Northern Spotted Owls and Marbled Murrelets in Northwestern California. The purpose of this guidance was to promote consistent and reasonable determinations of effects for activities that occur in or near northern spotted owl or marbled murrelet suitable habitat and result in elevated human generated sounds or human activities in close proximity to nest trees. The guidance applies to activities which have the potential to harass the northern spotted owl or the marbled murrelet as a result of substantially elevated sound levels or human presence near nests during the breeding season. The USFWS acknowledges that their report is to be viewed as a living document subject to continued, ongoing revision and improvement as additional data and experience are acquired. determinations with regard to the potential effects of construction and highway noise on these two avian species. This guidance is particularly valuable because it takes into consideration critical variables and tries to integrate them into a simple practical model. These variables include: types of sound sources, distances from the sound sources to the birds, level of ambient noise in the environment, levels of anthropogenic (human-generated) noise, sound-modifying features of the environment, visual cues correlated with the noise, and the hearing sensitivity of the bird. In this regard, the USFWS report provides an extremely worthwhile potential strategy for estimating noise effects. 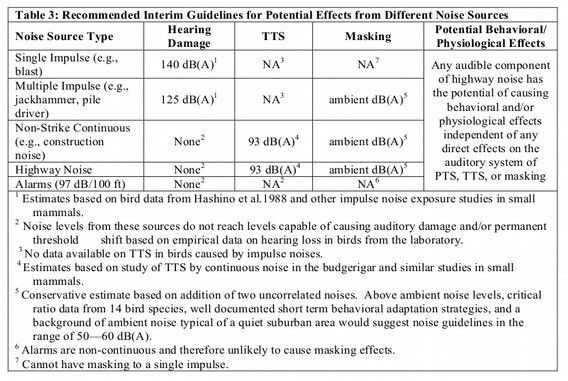 The noise levels discussed in the USFWS (2006) guidance are geared toward those that result in harassment or ‘flushing’ from the roost or nest. Independent, or in addition to, these effects, is the possibility of a more insidious effect of continuous highway noise on birds that rely on acoustic communication and song learning. The ability of specific birds to communicate acoustically may be affected by low levels of noise. Independently of such masking effects, birds may be driven from the area by flushing from either noise alone or some acoustic-visual stimulus. 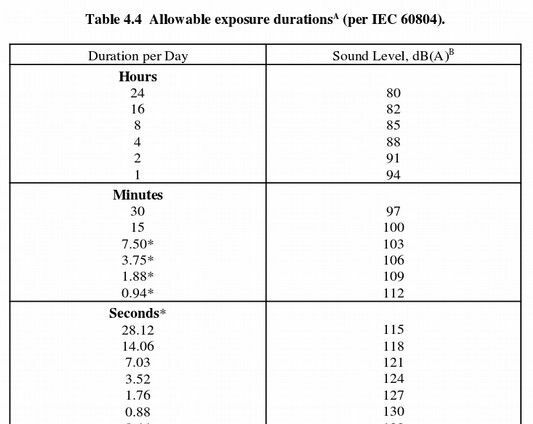 Table 2 summarizes typical maximum noise levels at 50 feet produced by typical construction equipment (FTA 2006). In contrast to traffic noise, noise from construction equipment acts like a point source and will typically drop off at a rate of 6 dB per doubling of distance. A study titled "Impacts of Acute and Long-Term Vehicle Exposure on Physiology and Reproductive Success of the Northern Spotted Owl" published in Ecosphere, June 2011, found that while the spotted owl is able to compensate for a low level of increased noise pollution and vehicle presence up to a threshold, "beyond which disturbance impacts may be greatly magnified - and even cause system collapse... 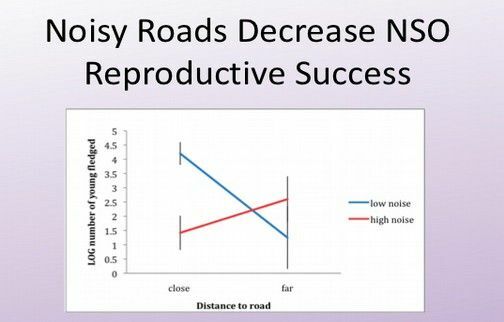 Reproductive success is higher close to quiet roads (likely due to better feeding). However, proximity to roads with high noise (i.e. traffic) decreases spotted owl reproductive success." This study found a direct relationship between habitat quietness and spotted owl reproduction. In 2007, the California Highway Department conducted a series of studies on the effect of highway construction and operation noise on birds. They found that toxic noise caused specific measurable harm on bird behavior and bird physiology. The louder the noise was, the fewer the number of birds there were. Noise caused problems in birds communicating with other family members and caused problems in birds locating prey or being aware that predators were hunting them. Noise also increased stress and reduced nesting and production of offspring. 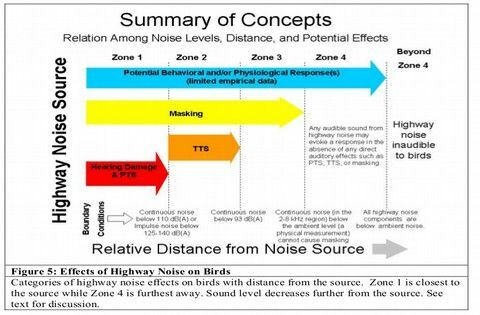 Zone 1: If a bird is in this zone, traffic and construction noise can potentially result in hearing loss, threshold shift, masking, and/or other behavioral and/or physiological effects. Continuous noise levels above 110 dB or a single blast noise over 140 dB for multiple blasts) will likely result in damage. other behavioral and/or physiological effects. Zone 3: At greater distances from the highway, but where the level of the highway noise is still at or above the natural ambient noise level, masking of communication signals from highway noise will occur beyond that which already occurs from natural ambient noise. This in turn may also result in behavioral and/or physiological effects. frequencies for communication, masking of communication signals is no longer an issue. Such guidelines are done in coordination and consultation with compliance protocols for the Federal Endangered Species Act. Note that the sound of a Growler jet is even greater than the sound of a highway jack hammer! The informal, but well known, 60 dB(A) noise level for evaluating the effects of noise on avian acoustic communication was based on the facts and reasoning presented above. The question posed was this: At what noise level, above that of a quiet natural environment, could one begin to see effects of highway noise on avian vocal communication? A quiet, natural environment was taken to be an overall sound pressure level of approximately 45-55 dB(A) - typical of a quiet rural to suburban area. Decisions by regulators must take into account the existing ambient noise levels in the region where the highway is being constructed and operated. Since communication – not just detection of a sound - is the animal’s goal, arguing for a lower noise level guideline of 55 dB(A) is probably safer and more realistic. physiology in many ways (Miller 1974; NIH, 1990; Ohrstrom and Rylander 1982; Ohrstrom and Bjorkman, 1983; Ouis 2001). While caution should rule in the extrapolation of data from humans to birds or other animals, the many similarities in physiology between humans and birds, and the reliance of both on sound for communication, suggests the possibility that stress and physiological effects on humans may be paralleled in birds (and other terrestrial vertebrates). There is direct evidence that highway noise may affect birds (e.g., Foppen and Reijnen 1994; Reijnen et al. 1995; Forman et al. 2002). In one series of papers, Reijnen and colleagues (Reijnen and Foppen 1994, 1995; Reijnen et al. 1995a, b; reviewed in Reijnen et al. 1995c) examined the effects of motorway traffic on breeding bird populations in the Netherlands. Reijnen and his colleagues concluded that highway noise has an impact on birds within several hundred meters of the highway. They also concluded that highway noise lowers the extent of bird breeding near highways. Peris and Pescador (2004) provided sound level measures at distances of 50-100 m from the roadways. They reported that the high traffic volume area had sound levels of 69±5 dB, medium density 46±3 dB, and low density at 36±2 dB (it was not indicated if this was dB SPL or dBA). Peris and Pescador (2004) showed that there were differences between the number of birds and the extent of breeding populations in each of the three areas. literature on the effects of other noise sources, most notably those produced by aircraft (airplane or helicopter) over-flight, on birds (e.g., Brown 1990). Generally aircraft noise is far more intense than noise from roadways. Moreover, exposure to aircraft noise is highly intermittent, whereas highway noise can often be characterized and modeled as a continuous, lower level, noise source. It is widely known that exposure to high level sounds can alter the physiology and structure of terrestrial vertebrates (e.g., Fletcher and Busnel 1978; Saunders et al. 1991). Moreover, there are standards set by the Occupational Safety and Health Administration (OSHA) recognizing that high levels of background sound have an impact on human well-being (e.g., Miller 1970; NIH 1990; von Gierke and Eldred 1993; Pearsons et al. 1995). These changes may include cellular changes, organ system changes, or stress level effects caused by exposure to sound. These standards also recognize that lower level sounds for extended periods of time can have a range of effects on humans and other animals. Biological Opinion for Effects to Northern Spotted Owls, Critical Habitat for Northern Spotted Owls, Marbled Murrelets, Critical Habitat for Marbled Murrelets, Bull Trout, and Critical Habitat for Bull Trout from Selected Programmatic Forest Management Activities March 25,2013 to December 31,2023 on the Olympic National Forest Washington. (USFWS Reference: 13410-2009-F-0388). Marbled murrelets are sensitive to human disturbance, especially during the nesting season. Loss of suitable nesting habitat is one of the primary threats to marbled murrelet survival. Effect determinations are highly dependent upon the proximity of project activity to potential nesting areas and foraging habitat, activity noise levels, removal of suitable nesting habitat, and project timing in relation to the nesting season. Many project types may warrant a determination of no effect on marbled murrelets. Projects that are at least 1 mile (if impact pile driving), or at least 0.25 mile for all other activities from suitable nesting habitat. Projects that involve clearing of mature coniferous forest could adversely affect spotted owl habitat. Loss of suitable nesting habitat is one of the primary threats to spotted owl survival. Conditions for NE and NLTAA effect determinations depend upon proximity of the project and include activity to nesting habitat, activity noise levels, modification of suitable habitat, and timing of activity in relation to the nesting season. Engels, S., Schneider, N-L., Lefeldt, N., Hein, C., Zapka, M., Michalik, A., Elberts, D., Kittel, A., Hore, P., and Mouritsen, H. (2014) Anthropogenic electromagnetic noise disrupts magnetic compass orientation in a migratory bird. Nature, v. 509: 353 - 356. (doi10.1038/nature13290). Kirschvink, J. L. (2014) Radio waves zap biomagnetic compass. Nature, v. 509: 296 – 297. All of this research makes it clear that spotted owls would be harmed by noise levels above 60 decibels. The US Forest Service is not allowed to simply passively stand by and let the Navy destroy the spotted owls with thousands of jets over flying the owls at speeds of 1000 miles per hour and noise levels as high as 150 decibels. In August 2004, the 9th Circuit Court of Appeals, in Gifford Pinchot Task Force v. U.S. Fish and Wildlife Service, ruled that the Endangered Species Act "was written not merely to forestall the extinction of species ... but to allow a species to recover to the point where it may be delisted." Andy Stahl, the Executive Director of the Forest Service Employees for Environmental Ethics wrote the following: The National Forest Management Act (NFMA) requires that “permits.. for the use and occupancy of National Forest System lands shall be consistent with the land management plans.” The Wenatchee National Forest’s 1990 land and resource management plan (LRMP) requires that “where a special use can be accommodated on private or other land, National Forest land will not be used.” Wenatchee LRMP at IV-55; see also Okanogan LRMP at Standard 16-3 (“Grant new authorizations only where... private land is not available to accommodate the use”). The Forest Service appears to take the position that a Master Agreement (“MA”) executed in 1988 between the Forest Service and the Defense Department trumps the LRMPs’ standards. To the contrary, the Master Agreement itself requires that military use permits be “in conformity with applicable forest plan(s). https://www.fs.fed.us/dirindexhome/fsm/1500/1533-1533.1.txt. Thus, the Master Agreement reiterates that the LRMP controls. However, even if the Master Agreement were silent on the matter, the law, i.e., the National Forest Management Act, trumps an inter-departmental agreement... The Forest Service should deny the Navy’s application for a special-use permit because the proposed use is not one authorized by Congress and inconsistent with the governing forest plans. Ironically, even if the spotted owls go extinct, the Forest Service will not be able to escape ESA paperwork and court sanctions. There will still be many other Endangered Species requiring protection from unrestricted logging. These include not only marbled murrelet but also the salmon fishery here in Washington State. Exactly how much radiation will be projected from each of the Growler jets in one day's training as they practice their warfare tactics? Why is the Forest Service not demanding full transparency and full disclosure as Federal law mandates? In the next section, we will review research on the noise levels of the Navy's new Growler jets and the harm this level of toxic noise would inflict on spotted owls. The first of these new F18 Growler jets was delivered to the Navy at Whidbey Island, Washington on April 9 2007. Almost immediately local residents and ground crews at Whidbey Island began to complain that the new Growlers instead of being quieter than the old Prowlers were actually MUCH louder. This led to an investigation by a Navy Auditor beginning in January 2008. The Navy Auditor hired a bunch of specialists to conduct detailed tests. He confirmed that the new Growler jets were in fact much louder than the old Prowler jets. 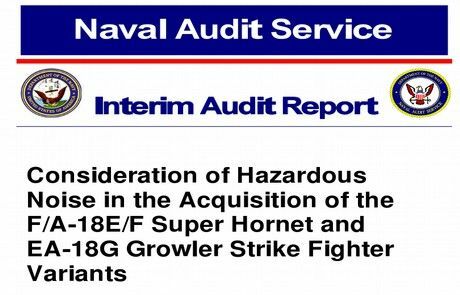 The Navy Auditor found that the development of the F18 Growler violated two Navy noise safety regulations. Part of the problem was that increasing the speed from 600 miles per hour to 1000 miles per hour required a bigger and louder engine. Another problem was the shape of the new plane – which included four pods under the wings – increased the turbulence and therefore the noise. 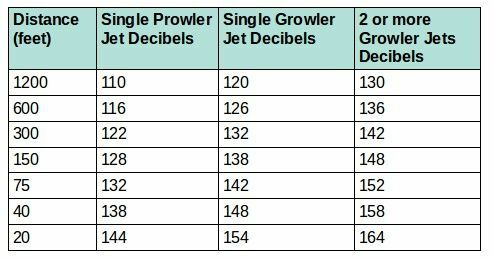 These factors and others caused the new Growlers to be twice as loud – or about 10 decibels louder – than the older Prowlers. In addition, first hand reports from hundreds of residents living near the Whidbey Island Naval Air Station indicate that the new Growler jets are much louder than the old Prowler jets. There are objective reasons for the dramatic increase in noise level with the new Growler jets. First, the new Growler jets are twice as fast as the old Prowler jets with a top speed of up to 1,200 miles per hour versus a top speed on the older Prowler jets of only 600 miles per hour. The Prowler jets are powered by two non-afterburning Pratt & Whitney J52-P-408A turbojet engines while the Growler jets are powered by two afterburning General Electric F414-GE-400 turbojet engines. The after burners on the Growler jets double the noise level (increase the noise level by about 10 decibels). In addition, the afterburners add 8000 pounds of thrust to the dry thrust of 14,000 pounds of engine thrust before the after burners kick in. The total thrust of the Growler jet engines is 22,000 pounds versus a total thrust on the Prowler engines of 10,400 pounds. Doubling the thrust of the engines is the main factor in doubling the maximum speed of the jet. But doubling the thrust of the two engines also doubles the noise of the engines which doubles the noise of the Growler jets. The Growler jets also use much more fuel than the Prowler jets and have a much shorter flying range. The Prowler jet has a range of 2,000 miles while the Growler jets have a range of only 1,200 miles. Prowler jets have a sleeker more traditional areodynamic design while the growler jets have a very unusual boxy shape with large pods under the wings for new electronic warfare equipment (see image previous page). The shape of the new Growler increases air turbulence which increases noise. Thus, the increased noise level of the new Growler jets is related to more powerful engines, jet speed and a bulky non-traditional shape. We will therefore conclude that the new Growler jets are about twice as loud as the older Prowler jets – about 10 decibels louder than the older Prowler jets. Their research used Bruel & Kjaer model 2270 decibel meters mounted on tripods and programmed to record the A- weighted sound pressure level and the un-weighted (linear) sound pressure level every second. A weighting is simply the un-weighted sound with the high and low frequencies filtered out. Sound was measured for a 30 to 60 minute period of time at each of five different locations. 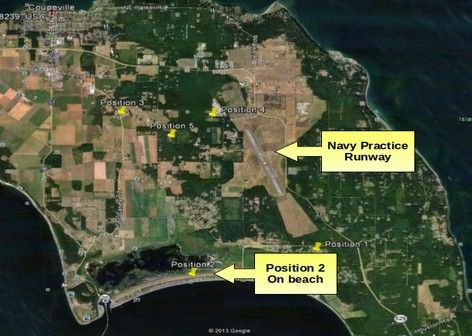 Because two of the locations near an airfield used for touch and go practice (Positions 1 and 4) and because Positions 3 and 4 had a high level of background noise, the most reliable data can from Position 2 which was a bird watching platform on a beach surrounded by a wildlife area. Below is an image of the five positions. The report measured the noise levels of Growler jets. Below is a Portion Study Table 1. Note that when jets were not flying over the Bird Watching platform, the background noise level fell to 40 decibels. This test provides objective scientific evidence that the maximum noise level of Growler jets flying at a standard elevation (of over 1200 feet) with a background noise level of 40 decibels is about 113 dBA. Because the background noise level in an Old Growth forest is 10 to 20 decibels less than the Puget Sound beach, the Maximum Noise Level of Growler jets over an Old Growth Forest is about 120 dBA at a distance of about 1,200 feet. There is a well known ratio of a 6 decibel increase for every halving of the distance (this is also called the Inverse Square Law). These numbers correspond closely to all three Navy Sound research reports. 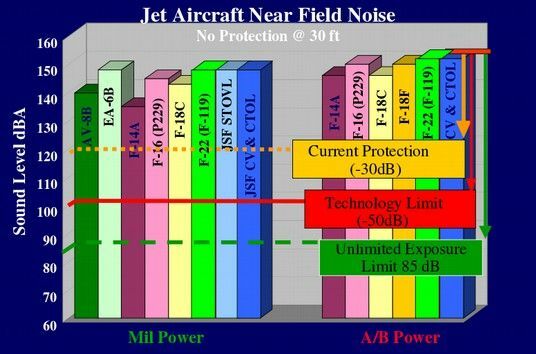 The following graphic shows the F22 which has about the same noise level as the Prowler. 50 feet from the F22 (Crew Chief Position) was measured at 139 decibels and 20 feet from the jet was measured at 150 decibels. The Navy proposes to attack spotted owls 11 times per day for 260 days per year. This is 2,860 attacks per year. Each of these attacks would involve 4 to 8 Growler jets flying in close attack formation for a total of more than 11,000 flyovers per year. Studies indicate that two or more jets flying closely together have about twice the noise level of one jet. These jets will be as close as 1200 feet above the surface. But since owls nest in trees that are higher than 200 feet, the jets could be as close as 1000 feet above the owls. Therefore the maximum exposure of the owls for two or more jets could be as high as 130 decibels. We will therefore construct a curve based upon a fixed point of the owls experiencing a maximum noise level of 130 decibels when 3 or more jets fly directly overhead at a distance of 1200 feet (one quarter mile). Assuming the jets are flying at a speed of 720 miles per hour or 12 miles per minute, the owls would begin to hear the jets about 2 minutes before they arrive. At the 2 minute mark, the jets would be 1200 feet or one quarter mile above the owls. The owls would therefore be exposed to noise above 80 decibels about 60 seconds or 1 minute per attack or 11 minutes per day and toxic noise above 100 decibels for 30 seconds per attack for a total of about 6 minutes per day. The Environmental Protection Agency and World Health Organization have both concluded that humans should not be exposed to toxic noise above 110 decibels for more than 2 minutes per day and should not be exposed to toxic noise above 120 decibels for more than 7 seconds per day. Therefore the owls, with their extremely sensitive hearing, would be exposed to toxic noise at a level and time that is twice as long and twice as loud as is known to cause permanent hearing damage in humans. More important, the EPA and World Health Organization have determined that exposure to noise above 120 decibels can cause permanent hearing damage in humans in as little as 7 seconds. Here is a table published by the World Health Organization manual page 95:. Despite the objective evidence that the sound from one Growler Jet is as high as 113 decibels at a distance of 1200 feet, and is at least twice as loud as the older Prowler jets, in a 2010 report to the US Fish and Wildlife Service, the Navy told the Fish and Wildlife Service that the new Growlers had almost the same volume as the old Prowlers. The above sentence means that all the Navy gave the US Fish and Wildlife Service was a sound measurement comparing the Prowler Jets to the Growler jets measured at a DISTANCE OF 4.6 MILES AWAY!. At this extreme distance, either jet had the sound of a normal human conversation or 62 decibels. 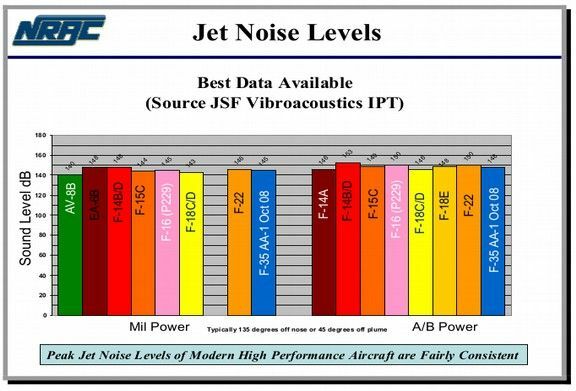 But the real question is why the Navy did not report the decibel rating for a plane flying within 1200 feet of the surface – since this is what they proposed to do. Also, why didn't the US Fish and Wildlife Service demand this information since it would be critical to determining whether these jets might cause serious harm to the survival of endangered species? Instead of conducing their own independent research as required by the Endangered Species Act, the Fish and Wildlife Service merely believed the Navy. Based upon the Navy's fraudulent claim, the Fish and Wildlife Service concluded that the Growler jet overflights would peak at 86 decibels. The actual maximum noise of a pack of Growler jets is at least 113 to 130 decibels which is up to 16 times louder than the claimed level of 86 decibels. The US Fish and Wildlife Service then used a study on Mexican Spotted owls to conclude that spotted owls and marbled murrelets could handle up to 92 decibels without suffering permanent hearing damage. On page 2 of this public comment, we calculated that the impact on Northern Spotted Owls is 5.6 million times greater than the impact studied on the Mexican spotted owls. Because the Navy's estimated Growler noise peak of 86 decibels was less than the 92 decibels of the Mexican spotted owl study, the US Fish and Wildlife Service issued a 2010 Biological Opinion concluding that the new Growler jets would not harm the spotted owls and marbled murrelets in the Olympic Mountains during Navy War Games. What is most absurd about the Fish and Wildlife Service claiming that owls can handle 92 decibels is that in their latest field manual, the Fish and Wildlife Service warns that any noise disturbance above the ambient level (of 20 decibels) could disturb the owls and “shall be postponed.” PROTOCOL FOR SURVEYING PROPOSED MANAGEMENT ACTIVITIES THAT MAY IMPACT NORTHERN SPOTTED OWLS Endorsed by the U.S. 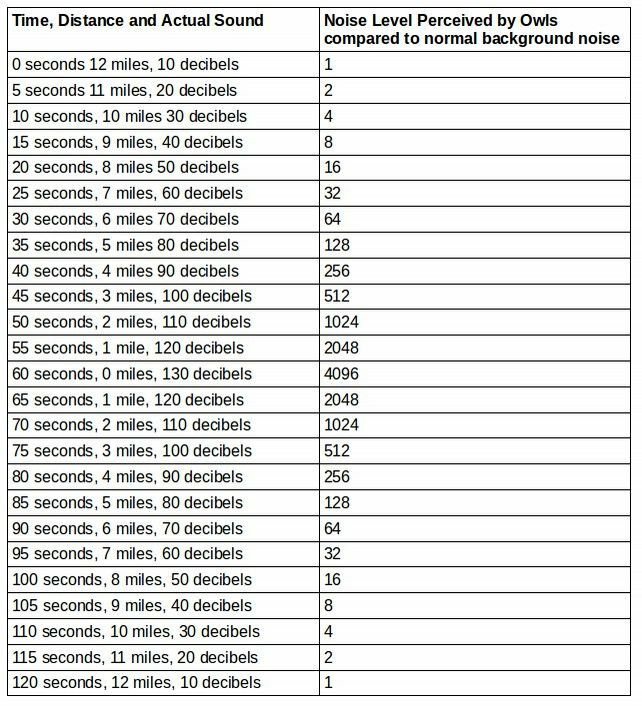 Fish and Wildlife Service, February 2, 2011, Revised January 9, 2012 Obviously 92 decibels is 130 times louder than the ambient level of an Old Growth Forest! The Navy then used the 2010 Fish and Wildlife Biological Opinion in August 2014 to conclude that the expansion of their war games from 45 planes to more than 100 planes would have no effect on the spotted owls and marbled murrelets and thus neither the Navy or the Forest Service or the US Fish and Wildlife Service needed to conduct any studies or submit an Environmental Impact Statement. The Navy was well aware of the noise problems on Prowler and Growler jets because it has been studying this problem for years – because this problem has caused Navy crews to go deaf just being around these jets. We will breifly review three of these studies – done in 2009, 2008 and 2000. The F18 Growler uses a slightly louder and bigger engine than the F18s tested above. 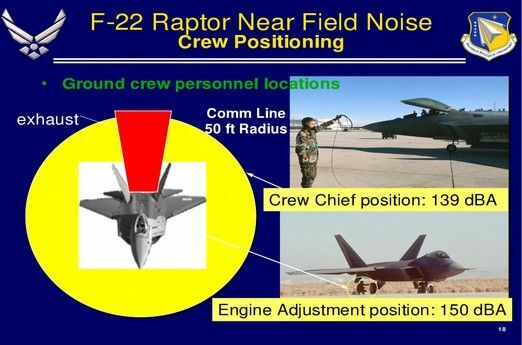 This, the Navy not only knew in 2009 that the Growler jets produced toxic noise of 150 decibels up close and 120 decibels at 1200 feet – but that newer F35 jets they plan on using in the Olympic Electronic Warfare zone will be even louder than the F18 jets. In violation of NEPA and EPA federal regulations, none of this was disclosed to to the US Fish and Wildlife Service in 2009 or 2010. F-14B, EA-B and S-3B Aircraft”, 2002. Technology Plan Final Report”, 2000. 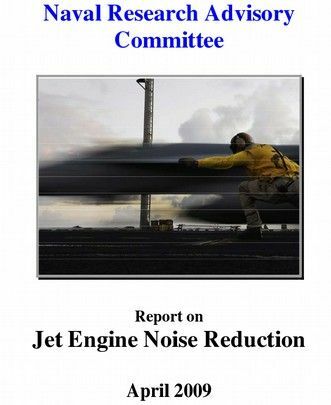 On page 7 of his 35 page report, the Auditor wrote: Summary of Audit Results: The EA-18G (Growler) emits a maximum of 150 decibels, which is well above the noise level considered hazardous to hearing (greater than 84 decibels)...This is contrary to the system safety design order of precedence specified in the MIL-STD-882D. This report noted that even the older F18s emitted 150 decibels at a distance of 30 feet. Even the best ear mufflers in the world are only able to reduce the sound by 30 decibels. This means that flight crews wearing these mufflers were still exposed to 120 decibels of noise – known to cause permanet hearing damage. The report claimed that the noise level for humans needed to be reduced below 85 decibels to avoid permanent hearing damage. (See graph below). A group near the Whidbey Island Naval Air Station in Washington State also sued over the extremely toxic jet noise of the new F18 Growler jets. Hundreds of citizens from countries all around the world have complained about the toxic level of noise coming from the new Navy jets. With so much research confirming the actual noise level of F18 Growler jets and prior versions of the Growler jets, it is concerning that the Navy was willing to decieve the US Fish and Wildlife Service into believing that the noise level of the new F18 Growler jets was under 90 decibels. It is even more concerning that the US Fish and Wildlife Service took the Navy's word for it and failed to conduct any kind of independent investigation as required by the Endangered Species Act. about the noise levels of its new F18 Growler jets? There are two potential reasons. The first and most obvious reason is that the Mexican Spotted Owl study had an upper noise limit of 90 decibels. Therefore, the new jets had to be reported at a number below 90 decibels or a complete environmental impact statement would have been required. Second, the National Environmental Protection Act requires a new Environmental Impact Statement if the change in fighter jets results in a “significant” impact. The Environmental Protection Agency, Region 10 considers a noise level increase of 5 decibels to be a significant impact. The Navy therefore could not admit that the new Growler jets were actually 10 decibels louder than the older Prowler jets because this would have automatically triggered an Environmental Impact Statement. A new Environmental Impact Statement would in turn have revealed that the actual maximum noise level of the new Growler jet was between 120 to 130 decibels. This confirmation would threaten the continuation of the entire Navy warfare training program. instantaneous permanent damage. Without adequate heøring protection, any exposure to noise levels qbove II5 dB is likely to cause permanent hearing loss." NEPA regulation 5 U.S.C. $ 706 provides authority for this Court to "compel agency action unlawfully withheld or unreasonably delayed." NEPA is intended to ensure that environmental issues are fully considered and incorporated into the Federal decision making process. An Environmental Impact Statement ("EIS") must be prepared for proposed major Federal actions that will have significant impacts on the human environment. The Council on Environmental Quality's NEPA regulations define major federal actions subject to evaluation under NEPA to include, among other things, both "new and continuing activities." 40 C.F.R. $ 1508.18. The Navy has adopted NEPA regulations that further define and interpret what Navy actions are considered "continuing activities" subject to review under NEPA. The Navy's NEPA regulations, at 32 C.F.R. $ 775.69(c), provide that preparation of a NEPA document is necessary for activities "which are presently being carried out in fulfillment of the Navy mission and function, including existing training functions" where "there is a discovery that the environmental effects of an ongoing activity are significantly and qualitatively different or more severe than predicted in a NEPA document prepared in connection with the commencement of the activity." should be considered a proposal for a new action and be documented accordingly." activity are significantly different or more severe than predicted, or if there is a substantial change in the continuing activity with a potential for significant environmental impacts. 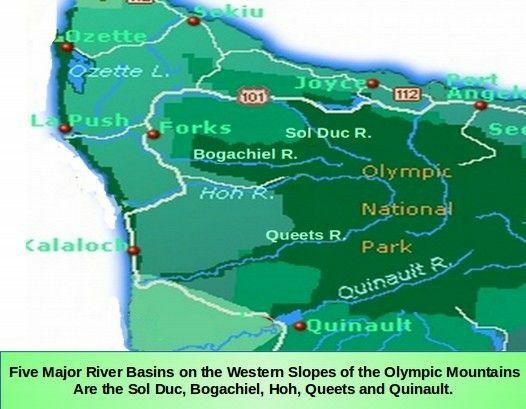 As discussed above, both situations exist with the Navy's request to expand their military training operations on the western slopes of the Olympic Mountains. First, the environmental effects of F18 Growler jets are much more severe than the Navy told the US Fish and Wildlife Service in 2010. Second, the sheer quantity of Navy flyovers as well as the length of the time for the Special Use Permit are much greater than the Navy admitted in 2010. Both of these changes would resut in a dramatic increase in the adverse impact of the Navy's proposed project. agency action of preparing an environmental impact statement and holding public hearings before such an application could even be considered by the Forest Service. In a case that is very similar to, if not nearly identical to, the Navy's proposal to expand military training activities over land that is critical habitat for spotted owls and marbled murrelets, the Navy also has proposed expanding their military training activites in oceans that are critical habitat for many ocean living endangered species. On January 26, 2012, in response to this plan to conduct war games in critical ocean habitat, a coalition of conservation and American Indian groups, led by Earth Justice and the National Resources Defense Council sued the National Marine Fisheries Service (NMFS) for failing to protect thousands of whales, dolphins, porpoises, seals, and sea lions from U.S. Navy warfare training exercises along the coasts of California, Oregon, and Washington. Earthjustice, representing InterTribal Sinkyone Wilderness Council, Center for Biological Diversity, Friends of the Earth, Friends of the San Juans, Natural Resources Defense Council (NRDC), and People For Puget Sound, filed this lawsuit in U.S. District Court for the District of Northern California challenging NMFS’s approval of the Navy’s training activities in its Northwest Training Range Complex. The lawsuit calls on NMFS to mitigate anticipated harm to marine mammals and biologically critical areas within the training range that stretches from Northern California to the Canadian border. In late 2010, NMFS gave the Navy a permit for five years of expanded naval activity that will harm or “take” marine mammals and other sea life. The permit allows the Navy to conduct increased training exercises that can harm marine mammals and disrupt their migration, nursing, breeding, or feeding, primarily as a result of harassment through exposure to the use of sonar. After 40 years, the Endangered Species Act Still Counts... Federal Judge quotes from Endangered Species Act of 1973! 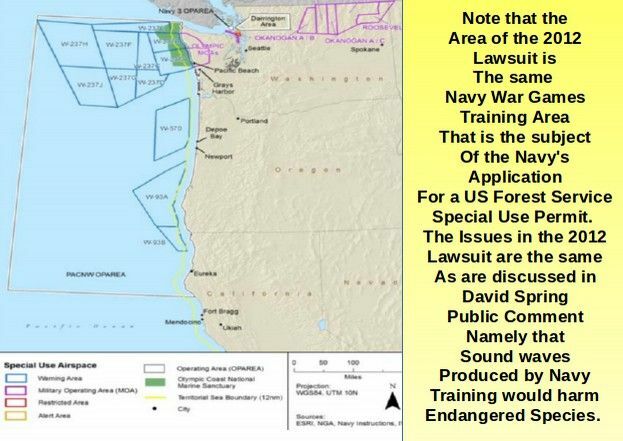 On September 26 2013, a federal court found in favor of the environmental coalition and found that the government violated the Endangered Species Act when permitting Navy training activities in the Northwest Training Range Complex. The decision requires the National Marine Fisheries Service (NMFS) to reassess its permits to ensure that the Navy’s training complies with the Endangered Species Act’s requirements for the area’s endangered Southern Resident killer whales, blue whales, humpback whales, fin whales, sei whales, sperm whales, and Steller sea lions. The government can no longer ignore science showing that the Navy’s use of sonar is more harmful to whales and dolphins than previously thought. The Navy’s use of mid-frequency active sonar can kill, injure, and disturb marine mammals. NRDC and other concerned organizations (InterTribal Sinkyone Wilderness Council, Center for Biological Diversity, Friends of the Earth Friends of the San Juans, and People for Puget Sound) challenged the Fisheries Service’s permitting of the Navy’s activities in the Pacific Northwest in January 2012. With its ruling, the federal court found that the agency’s approval of the Navy’s activities ignored the best available science showing that marine mammals are far more sensitive to sonar that can cause hearing loss and other injuries... This court ruling should remind NMFS that its preeminent obligation is to endangered species under the Endangered Species Act, not to applicants seeking to conduct harmful activities regardless of the consequences. In an opinion released on September 25 2013, Magistrate Judge Nandor Vadas, U.S. District Court for the District of Northern California, found that the agency’s approval of the Navy’s training activities in its Northwest Training Range Complex failed to use the best available science to assess the extent and duration of impacts to whales and other marine mammals. The decision requires the federal agency to reassess its permits to ensure that the Navy’s training activities comply with protective measures in the Endangered Species Act. Here are some quotes from the federal judge, Nandor Vadas, in a 43 page landmark opinion signed on September 25 2013.
endangered and for the designation of their critical habitat. 16 U.S.C. § 1533. The Secretary of the Interior is responsible for listed terrestrial and inland fish species and administers the ESA through the U.S. Fish and Wildlife Service (“FWS”). The Secretary of Commerce is responsible for listed marine species and administers the ESA through the National Marine Fisheries Service (“NMFS”). 16 U.S.C. § 1532(15); 50 C.F.R. §§ 17.11, 402.01(b). ESA Section 7(a)(2) directs each agency to insure, in consultation with the FWS or the NMFS (“the consulting agency”), that “any action authorized, funded or carried out by such agency... is not likely to jeopardize the continued existence of” any listed species or to destroy or adversely modify critical habitat that has been designated for such species. 16 U.S.C. § 1536(a)(2). Consultation is required if the agency proposing action (“the action agency”) determines that the proposed action “may affect” listed species or critical habitat. 50 C.F.R. § 402.14(a). If such a determination is made, the action agency may pursue either formal or informal consultation. See id. 15 §§ 402.13-402.14. Formal consultation is required unless the action and consulting agencies concur, in writing and after informal consultation, that the proposed action is “not likely to adversely affect” listed species or critical habitat, in which case the consultation process is terminated and no further 18 action is necessary. Id. §§ 402.14(b)(1), 403.13(a). “Where adverse effects are likely, the requirement for formal consultation is triggered. See id. At the conclusion of formal consultation, the consulting agency issues its “biological opinion” as to whether the proposed action is likely to jeopardize the continued existence of any listed species or destroy or adversely modify critical habitat. Id. § 402.14(h). To “jeopardize the continued existence of” means “to engage in an action that reasonably would be expected, directly or indirectly, to reduce appreciably the likelihood of both the survival and recovery of a listed species in the wild by reducing the reproduction, numbers, or distribution of that species.” 50 C.F.R. § 402.02. The biological opinion must be based on the “best scientific and commercial data available.” 16 U.S.C. 27 § 1536(a)(2); 50 C.F.R. §§ 1536(a)(2), 402.14(g)(8).” (my emphasis added above). “If jeopardy or adverse modification is found, the [consulting agency] shall suggest those reasonable and prudent alternatives which [it] believes would not violate [ESA Section 7(a)(2)] and can be taken by the [action] agency or applicant in implementing the agency action.” 16 U.S.C. 4 § 1536(a)(3)(A). However, where no jeopardy or adverse modification is found, the ESA imposes no similar requirement on the consulting agency; rather, the proposed action may proceed as planned, subject to potential restrictions on incidental take described below. On June 15, 2010, the NMFS issued the Final Biological Opinion (“the Five Year BiOp”) concluding that the authorized take and associated training activities are not likely to jeopardize the continued existence of any species listed as threatened or endangered under the ESA. AR Doc. A.1. There are no disputed facts to be resolved. Instead, the function of the court is to determine whether the agency properly made the decision it did, based on the evidence in the administrative record... Summary judgment is appropriate when it is demonstrated that there exists no genuine issue as to any material fact, and that the moving party is entitled to judgment as a matter of law. Congress enacted the Endangered Species Act “to provide a means whereby the ecosystems upon which endangered and threatened species depend may be conserved [and] to provide a program for the conservation of such endangered species and threatened species.” 16 U.S.C. § 1531(b). The ESA requires in Section 7(a)(2) that all federal agencies, in consultation with the NMFS and/or the U.S. Fish and Wildlife Service, “insure that any action authorized, funded, or carried out by such agency . . . is not likely to jeopardize the continued existence of any endangered species or threatened species or result in the destruction or adverse modification of” their critical habitat. 16 U.S.C. § 1536(a)(2). The obligation to “insure” that an action is not likely to jeopardize a species or destroy or adversely modify its critical habitat requires the agencies to “give the benefit of the doubt” to endangered or threatened species and to place the burden of risk and uncertainty on the proposed action. Sierra Club v. Marsh, 816 F.2d 1376, 1386 (9 th Cir. 1987) (holding that risk of uncertainty “must be borne by the project, not by the endangered species”). In fulfilling their obligation, agencies must base their decisions on the best scientific and commercial data available. 16 U.S.C. § 1536(a)(2). (emphasis added). Plaintiffs have challenged the NMFS’s failure to consider the new information found in the scientific studies in the LOA BiOp... the Navy has a duty under the ESA to consider that information when it permits activities in the Northwest Training Range Complex... The NMFS issued its LOA BiOp covering the remaining three years of training in October 2012 – well after the new data from the 2010 and 2011 dolphin studies was available. The duty to consult under ESA Section 7(a)(2) is triggered by “affirmative agency action.” See Cal. Sportfishing Protection Alliance v. F.E.R.C., 472 F.3d 593, 595 (9 th Cir. 2006). In its biological opinion, the NMFS must identify the “agency action” subject to consultation and “analyze the effect of the entire agency action.” Conner v. Burford, 848 F.2d 1441, 1453 (9 th Cir. 1988). “‘Action’ means all activities or programs of any kind authorized, funded, or carried out by Federal agencies in the United States or upon the high seas.” 50 C.F.R. § 402.02. Examples of actions given in the regulation include “the granting of licenses, contracts, leases, easements, rights- of-way, permits or grants-in-aid.” 50 C.F.R. § 402.02(c). The meaning of “agency action” is “determined as matter of law by the Court, not by the agency.” Greenpeace v. Nat’l Marine Fisheries Service, 80 F.Supp.2d 1137, 1150 (W.D. Wash. 2000). “There is little doubt that Congress intended to enact a broad definition of agency action in ESA.” Pacific Rivers Council v. Thomas, 30 F.3d 1050, 1054 (9 th Cir. 1994). In Pacific Rivers, the the Ninth Circuit found that certain Land Resource Management Plans (“LRMPs”) developed by the United States Forest Service constituted ongoing agency actions throughout their duration, not only at the time they were adopted or if they were revised or amended in the future. The court explained that, “[t]he LRMPs are comprehensive management plans governing a multitude of individual projects, indeed, every individual project planned in both national forests involved in this case is implemented according to the LRMPs.” Id. at 1053. The court concluded that, “because the LRMPs have an ongoing and long-lasting effect even after adoption, we hold that the LRMPs represent ongoing agency action.” Id. Thus, the court affirmed the district court’s ruling that the Forest Service was required to consult with the NMFS regarding a species of salmon listed as “threatened” under the ESA after the LRMPs were adopted. The ESA requires that all impacts of agency action – both present and future effects on species – be addressed in the consultation’s jeopardy analysis. See Conner v. Burford, 848 F.2d 1441, 1457-58 (9 th Cir. 1988), cert. denied, 489 U.S. 1012, 109 S.Ct. 1121, 103 L.Ed.2d 184 (1989) (the ESA “does not permit the incremental-step approach” of consultation because “biological opinions must be coextensive with the agency action.”). Moreover, there are significant reasons to reject the segmentation FWS has utilized in this case. If FWS were allowed to apply such a limited scope of consultation to all agency activities, any course of agency action could ultimately be divided into multiple small actions, none of which, in and of themselves, would cause jeopardy. Moreover, such impermissible segmentation would allow agencies to engage in a series of limited consultations without ever undertaking a comprehensive assessment of their overall activities on protected species. The ESA requires more; it “requires that the consulting agency scrutinize the total scope of agency action.” North Slope Borough v. Andrus, 486 F.Supp. 332, 353 (D.D.C. 1980), aff’d in part, rev’d in part on other grounds, 642 F.2d 589 (D.C.Cir. 1980) See American Rivers, 271 F.Supp.2d at 255. Finally, in Wild Fish Conservancy v. Salazar, 628 F.3d 513 (9 th Cir. 2010), the Ninth Circuit.. concluded that the decision to limit the analysis of the 2008 Biological Opinion to a five-year term of operations and management was arbitrary and capricious, and that the FWS committed legal error by limiting the scope of the action to five years. Id. at 532. In so doing, the court discussed at length the importance of the definition of the scope of an action for analysis of the adequacy of a biological opinion under the ESA. (emphasis added). The Ninth Circuit explained in Wild Fish Conservancy that the limited scope of the biological opinions in Conner violated the FWS’s obligation “to analyze the effect of the entire agency action.” Wild Fish Conservancy, 628 F.3d at 522 (quoting Conner, 848 F.2d at 1453). These realities make this case analogous to those in Wild Fish Conservancy. As discussed by the Ninth Circuit in that case, the shorter the delineation of the scope of an action, the less likely the NMFS is to find that the action impacts the viability of a threatened (or endangered) species. Wild Fish Conservancy, 628 F.3d at 522. That is, a series of short-term analyses can mask the long-term impact of an agency action. As the Ninth Circuit found, there could be “some impact,” but not an appreciable impact, “in each of several subdivided periods” of an operation that cumulatively would have “an undeniable impact.” Id. At 523. This is caused in part by the fact that the environmental baseline effectively resets at the beginning of each period. Id. at 523; see 50 C.F.R. § 402.02 (“Effects of the action refers to the direct and indirect effects of an action on the species or critical habitat. . . that will be added to the environmental baseline.”). The same issues exist here, in that the segmented analysis is inadequate to address long- term effects of the Navy’s acknowledged continuing activities in the area. (emphasis added). It is not for the court to dictate how long the term of the ESA analysis should be in this case. See Wild Fish Conservancy, 628 F.3d at 524. It must, however, be long enough for the NMFS to make a “meaningful determination” of whether the Navy's ongoing activities are “likely to jeopardize the continued existence of” any listed species or to destroy or adversely modify critical habitat designated for such species. The court will grant Plaintiffs’ motion for summary judgment on this issue. (emphasis added). Plaintiffs... “argue that NMFS’s ultimate no jeopardy and no adverse modifications conclusions stand or fall based on the Navy’s entire action, including its standard mitigation measures, which NMFS itself has found inadequate. Whatever label you put on them – an integral part of the agency action or mitigation or something else – reliance on these measures was arbitrary and capricious.” Plaintiffs argue that because the mitigation measures are part of the proposed action, the NMFS would have failed to consider the entire agency action if it ignored these measures in its analysis. 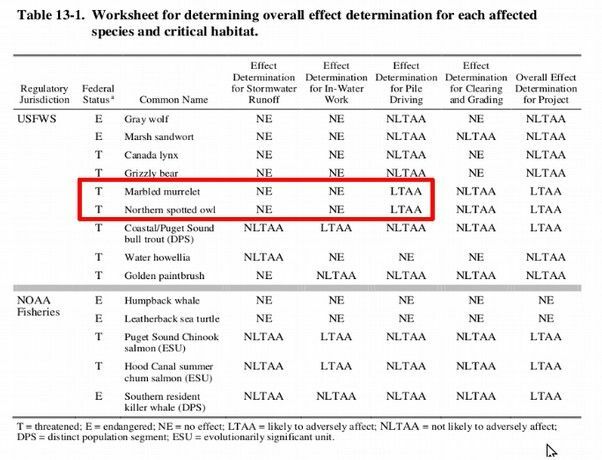 “cannot be seriously applied to Southern Resident killer whales.” Plaintiffs cite a NMFS finding that this population of killer whales is so fragile that, “the loss of a single individual, or the decrease in the reproductive capacity of a single individual, is likely to reduce appreciably the likelihood of survival and recovery.” (emphasis added). mitigation to “prevent harm” to Southern Resident killer whales, because there are two different “kinds of effects” the Navy must avoid. The first of these effects is direct impact to individual whales, and the second is the indirect effects that result in the displacement of whales or avoidance behaviors. Here, because of the likelihood of adverse effects, the NMFS and the Navy engaged in formal consultation. As a result, the Navy was not required to find that all adverse effects on listed species would be avoided. Rather, the NMFS was required to issue a biological opinion evaluating whether the adverse effects were likely to rise to the level of jeopardy. 16 U.S.C. § 1536(b)(3)(A). (emphasis added). The more specific contention now raised by Plaintiffs is that the NMFS acted arbitrarily and capriciously in failing to identify specific areas or prescribe additional mitigation measures in connection with the requirement that “efforts should be made to protect essential habitats, including the rookeries, mating grounds, and areas of similar significance for each species of marine mammal from the adverse effect of man’s actions.” 16 U.S.C. § 1361.” (emphasis added). This Judge sounded a lot like Judge Dwyer in the early 1990s. He simply agreed with the plaintiffs that there were significant defects in the Biological Opinion and ordered the NMFS to write a new Biological Opinion based on the best available science. But what was most important is that the judge made it clear that the NMFS had to consider the entire impact of the Navy plan over a 10 to 20 year period of time and could not limit their analysis to merely the immediate changes under review. This is exactly what hundreds of citizens have been telling the Forest Service in the present case. The Forest Service cannot limit its consideration to merely the addition of three trucks on its logging roads when the purpose of the trucks it to interact with hundreds of planes over the next 20 years! Earth Justice sued the National Marine Fisheries Service to challenge the permit and the district court blocked its implementation. NMFS initially appealed the federal judges ruling, but then in October 2014, they dropped the appeal and have now agreed to abide by the judge's ruling and issue a new biological opinion. Given the similarity between the present Navy Special Use Permit Application – based on a faulty Biological Opinion issued by the US Fish and Wildlife Service in 2010 which also ignored the best available science on protecting spotted owl habitat, the US Forest Service should reject the Navy application, ask the Navy to suspend all current flyovers of critical habitat in the Olympic Mountains and ask the US Fish and Wildlife Service to issue a new Biological Opinin based on the best available science. 2. Require the US Navy to pay either the US Forest Service or US Fish and Wildlife Service to conduct a field survey of the spotted owl population on the western slopes of the Olympic Mountains to accurately determine the rate of population decline and estimate the extinction threshold for this population. This study should also be completed no later than May 1 2015. 3. Extend the public comment period until July 1 2015. This will give the US Navy time to conduct the needed Noise studies of the F18 Growler jets and the older Prowler jets. It will also give the US Fish and Wildlife Service time to complete a survey of spotted owls on the western slopes of the Olympic Mountains, determine the rate of population decline, calculate the extinction threshold and submit their report to the public by May 1 2015. 4. Conduct official recorded public hearings in all affected communities as required by NEPA between May 15 2015 and June 15 2015 to allow the public a reasonable opportunity to ask questions of US Forest Service and US Navy officials and to make public comments on the proposed application. Reasonable opportunity means that each member of the public should be allowed at least 3 minutes to ask their questions and make their comments. This would also 20 people per hour to ask questions. Thus, to allow 200 people in each community to ask questions, the entire hearing should be scheduled for at least 10 hours and should be held in a room which would allow the attendance of at least 200 members of the public to sit. 5. 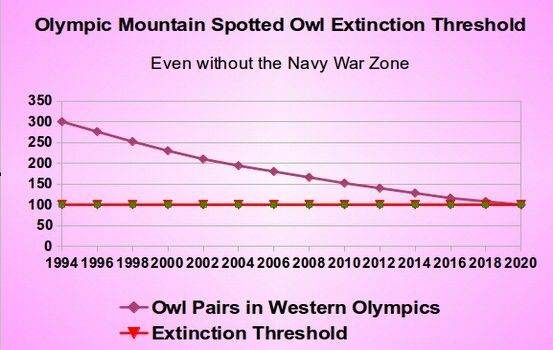 Request that the Navy immediately suspend all war game operations over the Olympic Peninsula until an accurate determination can be made regarding the effect that these current war games might have on the survivability of the spotted owl population in the Olympic Mountains. The evidence provided in this report, which includes the best available science on spotted owl populations indicates that even the current actions of the Navy are in violation of the Endangered Species Act and the 1994 Record of Decision. It is essential that the Navy's war games operations – and in particular any Navy Military Jet Fly Overs of Critical Habitat for Spotted Owls - be halted immediately in order to protect the spotted owls on the Olympic Peninsula from going over the extinction threshold. We believe that the evidence we have provided that Growler jet packs emit noise above 120 decibels and that such noise is capable of permanently harming spotted owls is beyond dispute. We also believe that the actual impact to spotted owls is more than 5 million times greater than the US Navy led the US Fish and Wildlife Service to believe in writing their 2010 Biological Opinion. We therefore ask that you making halting these Navy training flights your highest priority. Given the urgency of the need to protect the spotted owls on the western slopes of the Olympic Mountains from any further harm, we will be contacting your office in the next week to determine your willingness to immediately halt military jet flyovers of critical habitat for spotted owls.